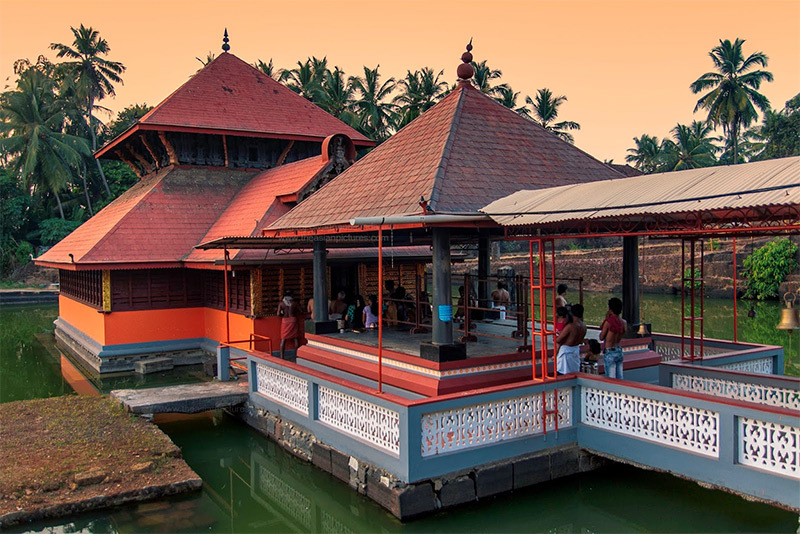 Ananthapura Lake Temple in Kasaragod, built in the 9th century, is the only lake temple in Kerala and is the moolasthanam (original abode) of Ananthapadmanabha, the deity of Sree Padmanabhaswamy Temple in Thiruvananthapuram. The garbhagriha of the temple is reachable only by a bridge. What is most amazing about the temple, is that a vegetarian crocodile has been guarding the temple for hundreds of years. The past of the temple is still obscure except for some legends. It was at this place where Divakara Muni Vilwamangalam, the great Tulu Brahmin sage, did penance and performed poojas. Legend has it that one day Lord Narayana appeared before him as a child. The boy’s face was glowing with radiance and this overwhelmed the sage. He became anxious and asked who he was. The boy replied that he had no father no mother and none at home. Vilwamangalam felt pity for the boy and allowed him to stay there. The boy proposed a condition that whenever he feels humiliated he will leave the place at once. He served the sage for sometime. But soon his juvenile pranks became intolerable for the sage and he reacted violently. Humiliated the boy disappeared from there after proclaiming that if Vilwamangalam wants to see him he would have to go to Ananthankat, the forest of serpent god Anantha. Vilwamangalam soon realized that the boy was none but the lord himself and he had great repentance. He found a cave at the place where the boy disappeared and he proceeded further into the cave in search of the boy. He reached the sea and proceeded further toward the south and at last he reached a woody area near the sea. Vilwamangalam saw the child who soon disappeared into huge illippa tree (Indian butter tree or Mahua tree). Immediately the tree fell down and assumed the shape of Lord Vishnu lying on a thousands hooded serpent. From very ancient times, one crocodile has been seen there. Though devotees used to take bath in the tank there is no instance of it harming anyone. Babia is the name by which this guardian is known by the devotees. It is the local guardian and the messenger of the temple. The only food that Babia takes is the offerings of the devotees. Usually it is a special gruel made of rice and molasses. After the worship, the food offered by devotees (prasadam) is given to Babia at noon. Temple authorities claim that Babia is a vegetarian and has never harmed anyone including the fishes in the pond. 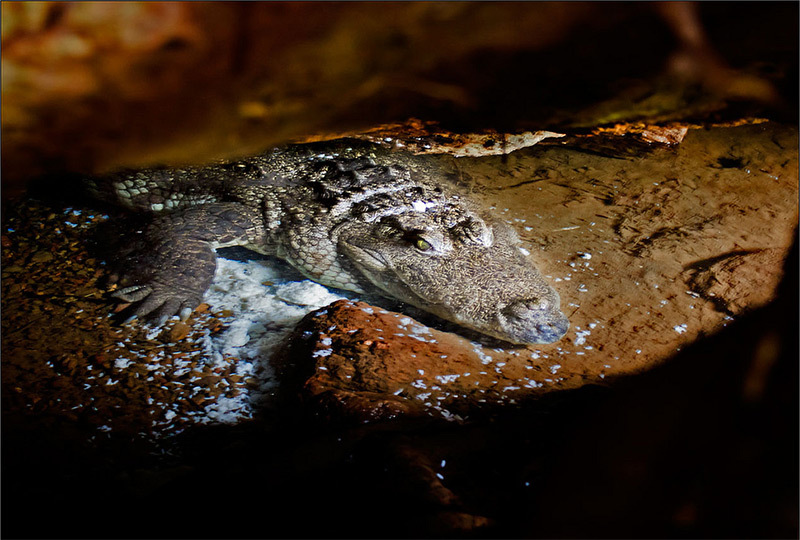 There is an interesting local legend that narrates the entire story behind the guardian crocodile. Once Sree Vilvamangalathu Swami, devotee of Lord Vishnu, was doing penance for his favourite Lord. While he was in his prayers, Lord Krishna in the form of a little boy appeared and started disturbing him. Being annoyed by the behaviour of this child, the saint pushed Lord Krishna aside with his left hand. The boy immediately disappeared into a nearby cave and the truth dawned on the saint as to who the boy was. The crevice into which Krishna is said to have disappeared is still there. The crocodile guards the entrance and the shrine. The cave where the devotee crocodile resides. In 1945, when the British soldiers were stationed there, one soldier shot dead the crocodile. To the surprise of everyone the soldier died within few days by a snake-bite. People believe it to be a curse by the serpent god Anantha. Soon another crocodile appeared in the tank and even now if one is fortunate one can see it. The legend goes that there is only one crocodile in the lake at a time. When one crocodile dies, another one appears in the lake. The devotees pay great respect to this crocodile. The temple is unique in its structural aspects for it is erected in the middle of an impressive lake of 302 feet. The lake is gifted with a perennial supply of pure spring water. We can find the ruins of temples all round the lake which stand testimony to the fact that it was part of a great temple complex. 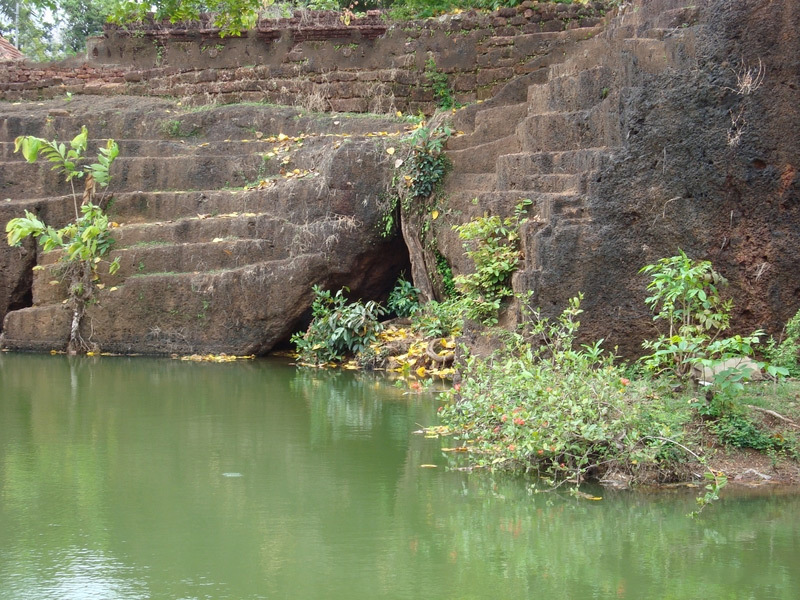 The sreekovil (sanctum sanctorum), namaskara-mandapam, thitappalli, and shrines of Jala-Durga and the entrance of the cave are located in the lake. The namaskara mandapam is connected to the eastern rock by a foot-bridge which is the only passage to the sreekovil. The principal deity is Lord Vishnu. One of the key features of the temple is that the original idols in the sanctum sanctorum were not made of metal or stone, but of a rare combination of more than 70 medicinal materials called `kadu-sharkara-yogam.’ These idols were replaced by panchaloha metals in 1972. They were donated by Kaanchi Kaamakoti Mathaadhipathi His Holiness Jayendra Saraswathy Thiruvatikal. Efforts are going on now to reinstall the idols made with `kadu-sharkara-yogam.’ The Lord Vishnu idol is in a sitting pose over a five-hooded serpent king Lord Anantha. The lake temple is open to all visitors regardless of caste or creed. The District Tourism Promotion Council has plans to preserve the temple and its surroundings for its uniqueness. The temple has an excellent collection of wood carvings on the ceilings of the mandapam. These carvings depict the incidents taken from the stories of dasaavatharam (the ten incarnations of Lord Vishnu). Some of them are painted. The Nava-grahas (nine planets) are painted at the muktha-mandapam. 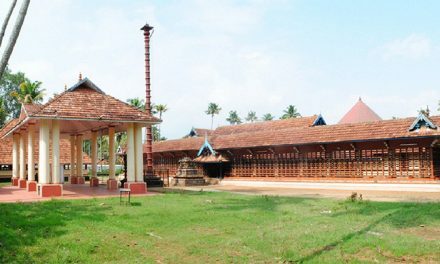 On either side of the sreekovil dwaara-palakas (jaya and vijaya) are beautifully carved in wood. The temple is open to all regardless of religion or cast. The nearest major railway station to Ananthapura Lake Temple is Kasaragod railway station which is about 12 km from here. There is also a railway station at Kumbala. Karipur International Airport, Kozhikode is the nearest airport which is about 200 km from here. To reach there by road one has to take a deviation from Naayakkaapp (5k m from Kumbala) on the Kumbala-Badiyatukka road. Please keep these stories coming. I absolutely love reading these on a daily basis! What a wonderful legend. Excellent read. Thank you. Wherever we visit any village temple in India, there is an interesting and surprising legend linked to that Temple and a great saint would have done penance there. Glory to Bharat Varsh. Glorious are indian temples in such a serene. sacred atmosphere most suited contemplation. It is a wonderful feeling knowing about such wonderful places and great legends. Thank you so much for sharing this. The soul is what matters, not the body. The crocodile is indeed a divine soul and blessed to be so close to the Lord all the time. Thanks for the information! Great to learn about the traditions and places in India..
Really amazing to read all this…….. It is very nice to read. Very interesting and the place appears to be very nice and tidy. Very nice story. please share these kind of stories..love to read it.. Thanks for enlighten us with ancient MYTH. Very good information and like to read divine informations.If possible include temple timings and staying facilities to have dharshan will be more helpful. this type news letters are very useful and think our elders, very much for doing this type of great work, please continue this for all over india. Great story. Thank you very much. I will make it a point to visit this temple. How can I get a PDF copy ? I need to forward to my Christian and Muslim friends to show we see God in all. Nobody knows where from HE comes and where HE goes. Vilwamangalam Swamiji a gifted soul who had the dharsan of the Lord Ananthapadmanabha as a young lad and it dawned on him only after HE left. It is pure devotion that makes miracles happen like that. Thank you for bringing out with fine photographs. Its a great information broughtout to all the believers of Lord. Namo Narayana!! 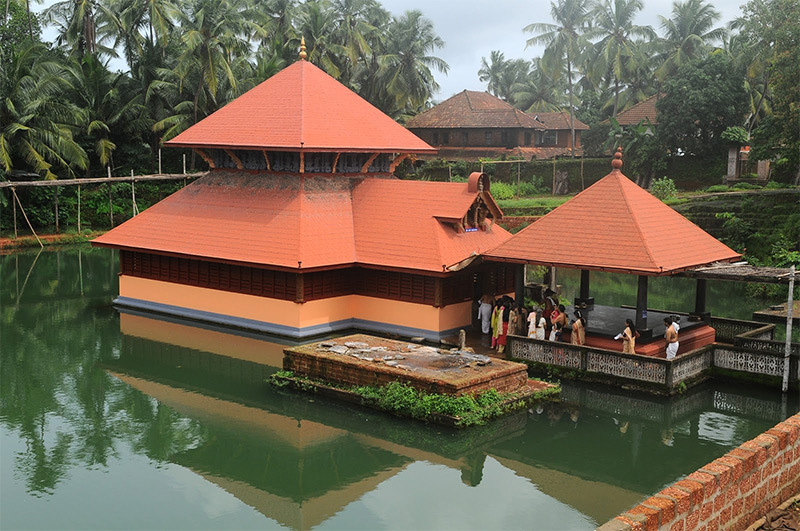 This blog on the Lord Anantha Padmanabha Swamy temple ijnh Kasargod District of Kerala is a comprehensive one with all aspects of the temple covered. I thank the author for giving such an illustrative article on the temple. I have also published a briefarticel on this temple with the title: Ananthapura Lake Temple. We have such sacred places in our Bharat and indeed it is great that we are getting to know more and more about our rich Dharmic Culture through such articles. However,please guard against such statements which have been twice repeated in this very article about the temple being open to people irrespective of caste and creed. In ancient Bharat the definition of caste was entirely based on the karmic DNA of the person in question.This truth is clearly written in the our SHASHTRAMS and BHAGAVAD GEETA that caste is based on the intrinsic GUNAS of the person. We HINDUS have fallen victim to the deliberate ‘western twisted’ understanding of caste system and without thinking make such statements that keep on giving life to such untruths. We have to undo this terrible damage done to our ancient SATTVIC heritage which discriminates against no one for we believe in OM TAT SAT!!!!!! very fine to such temple . i like to see . Loved the article. Just one correction.. the closest airport is Mangalore International Airport.. Its just 65 Kms to Kasargod from Mangalore. Very touching story. Would like to visit. OM NAMO NARAYANA..OM NAMO NARAYANA..OM NAMO NARAYANA..OM NAMO NARAYANA……..OM NAMO NARAYANA…. I visited this place twice, first time I visited unexpected, as we were traveling to kerala trip during the night wanted to stay some temple to take rest, and came to this temple, its very good place and very holy place, believe me the place gives you so much piece and pleasure, the temple people helps you in everything food accommodation and story of the temple etc..
visited second time to take specific darshana. Lord krishna is the absolute truth………the supreme personality of the god head……………………………haribol!!!!!! I very much appreciate and enjoyed reading this article. Divinity is always associated with nature. Thanks for the article on a less known temple. I’m from a place which is close to Kasaragod but never heard of this temple or the legend behind it. We are blessed to be born on a country of such culture and rich heritage but rarely appreciate it until a whiteskin comes and talks about it. We must document such legends for our future generation. One may believe in them or not. But it’s part of our heritage. Very informative articles which ignite the thirst for knowing more of our ancient history and culture.